Jack's been out and about looking at all sorts of bugs and in this issue he takes us on his travels with the Savannah Guides. We also welcome 'Trinity Catholic College' who have contributed to the new segment 'Around the Schools'. Finally, National Science Week festivities, the launch of a new range of insect education kits as well as all the regular features. Cockroaches are the topic in both The Bug Files and Land for Wildlife story. In late April I attended the 2001 Gulf Savannah Guide School, where I was invited to talk to the guides about the diverse world of insects. With this years theme 'Back to Basics' we travelled to a national park in the gulf region known as Bullaringa. Starting our journey to this remote national park we leave Mount Surprise at 5 am in the morning for a 3� hours drive where we reached the Bullaringa National Park. As the park has no formal access; the drive in was the usual bush track standard. On arrival, everyone soon took to bushwalking. Along with QPWS representatives and guides from far and wide, Mr Ron Richards one of the traditional landowners guided us through the sandstone gorges in the area he called 'Ewamian Country'. Also in the group was Mr Jack Borgert whose family operated a cattle station in the area prior to National Park listing. On that first day as we descended down into a narrow gorge leaving the heat of the open forest above, it was obvious the area ahead was certainly unique. Soon the environment changed to a cool microclimate, which was overhung by Syzigiums and Eucalypt trees. Crow butterflies hung by the hundreds from the sandstone overhangs, remnants of what had once been ancient inland sea. Fossilised Stromatolites formed strange rock formations above and further down in the gorge a boulder that featured prominent starfish fossils showed the only other sign of the former history of the area. Here Aboriginal activity was evident with their marks adorning the rock shelters. As we continued, many bushes were shrouded in metallic green bugs by the thousands and Blue Banded Eggfly butterflies appeared. Deep into the gorge and taking advantage of a spring, many dragonflies were active. One species, � red and � blue, I had never encountered before. Also of interest was a large healthy Bird Eating spider living in the boulders. That evening we camped in the park and with permission from National Parks an insect light was run. Considering it was so late in the summer season for most insect activity the warm night produced a surprising number of beetles and moths which most of our group had never seen. Discussions revolved around these insects and their life histories. The following day, we returned to Mount Surprise and although our visit was brief and at the end of the insect season, we had received a glimpse into the insect world in Bullaringa National Park, Having travelled and studied the insects of the Gulf region for many years now, this trip with the Savannah Guides was truly enjoyable. Not only did I meet some great people but also had the opportunity to visit areas that I had never been to before. I can highly recommend a trip with the Savannah Guides. If you're involved in a school project or study group working on insect related topics then we want to know about your activities! Reports on insect observations or surveys; class activities; even an environmental issue being addressed at your school or completing a group project, as long as insects play a part in the overall project we would like to hear from you. Only one catch, you're group must be teacher/leader administered. This means we need a letter from your teacher or group co-ordinator confirming the activities of your project. The most interesting contributions will be posted on our regular website update. All contributions will be acknowledged and if accepted, contributors will receive notification as to when their work will be posted. We welcome our first contributor Fiona Boghos from Trinity Catholic College in Auburn, NSW. Fiona reports on the Giant Burrowing Cockroaches in their classroom. by Fiona Boghos, Yr 11 Biology. 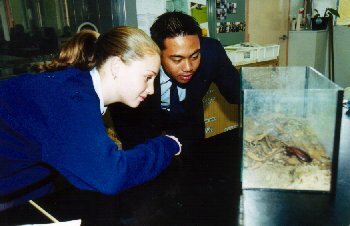 The Science Department of Trinity Catholic College obtained four of these native Australian cockroaches in 2000. These cockroaches were obtained from the Australian Insect Farm and have been at Trinity for a year. By Christmas time 2000, there were six offspring. Mrs. Nicholson, Trinity's lab technician, feeds them leaf litter from Gosford as it tends to be less polluted. She also sprays them with water daily for them to drink. These cockroaches are different from regular household cockroaches as they are disease-free. Mrs. Nicholson has observed that one of the adult female cockroaches is a lot more dominant that the others, staying on top of the leaf litter and very rarely burrowing, possibly so as to guard the offspring. Fiona also supplied images with her story, which can be viewed on the update page for this newsletter. Many thanks go to Fiona for her contribution. Once again the AIF attended the National Science Week activities held at the Trinity Bay High School in Cairns. As usual it proved to be an exhausting evening with an estimated attendance of around 5,000 people in 2 � hours. Being tactically positioned between exhibits by Australian Quarantine and Inspection Service plus the Tropical Health Unit (Mosquito eradication), sure had our live critters a little jumpy! If you're interested in teaching your students about insects, then these kits are just what you need. A new range of insect education kits specially designed for classroom use is now available. All insect kits are easy to use and a great way to present insects to your students. We now have live insect kits, which contain completely harmless insects, or for a permanent school resource we also have preserved study kits available. All come complete with loads of information including teacher work sheets with b&w masters; care sheets as well as fact/work sheets, which have colour images. Go to the new web site page 'School Resources' for a complete listing of the variety of kits available and their contents. As we head into winter, adult beetles occupy only a handful of shelves in the workshop. For the majority of beetle species, most larvae have emerged and are speedily developing. Stick insects continue to emerge daily. With the host plants in the recently revamped stick insect house coming along, these nymphs will be taking full advantage of the healthy host plants. The various snail species have bred extremely well this season. Instigated a number of years ago and involving the research of local species, we are pleased with the progress of the snail breeding programmes. Finally, Cricket and Millipede breeding went well this season with good numbers of young now feeding. Described by Italian entomologist Mauro Daccordi. This beetle was first found on the AIF property in 1994 at which time we began to study its biology. After so many years, we affectionately came to refer to it as the Garradunga beetle. Large for a chrysomelid, body convex, sub-rectangular; length 12.75mm; width 9.00mm. Base colour metallic green with various trogon yellow reflections. Viviparous species. Dissection of allotype revealed 6 larvae in the oviduct. This feminine generic name is composed of the Greek name elytra (pteros) and part of the locality name, Garradunga, near Innisfail in Queensland, the home of this genus, with only one known species. Species - from the latin "admirable" for the shining colours and shape of the body. In the same publication, Dr Daccordi also described a beetle found in 1990 on the AIF property. Body elongate, with strongly shiny, subparallel, regularly punctated, and broadly margined elytra; length 7.8mm; width 4.0mm. Base colour chrome orange; on pronotum, two wide mahogany red blots curving outwards often fuse together in the middle. This species is dedicated to one of its collectors, Mr. J Hasenpusch of Garradunga, Innisfail, Queensland. The Eurhynchini are a small group of brentid weevils endemic to Australia and New Guinea. For over 100 years the larvae of the weevil tribe Eurhynchidae had remained elusive. By 1994 attempts to resolve the classificatory position of the group had prompted Dr. Elwood Zimmerman (from CSIRO) to identify "�the discovery of the immature stages of the Eurhynchidae [as] one of the most desired objectives in the study of the Australian weevil fauna. In August 1997, Jack Hasenpusch found a larva of the Eurhynchid weevil - Aporhina australis here at the AIF. In reply to an earlier request by Dr. Elwood Zimmerman for such a specimen, the sample was promptly forwarded. For formal study and description, the sample was forwarded to Ms. Brenda May in New Zealand. Although she had managed to assess the sample as being a brentid larva, her death in 1998 precluded her from formally describing it. The specimen was then returned to Dr. Zimmerman, who invited Dr. Rolf Oberprieler from Africa to describe it. Dr Oberprieler completed the description with the paper presented at the John Lawrence Celebration Symposium in Canberra in 1999 and published in the Invertebrate Taxonomy, 2000. While on a 1997 field trip in the gulf country, Jack observed a buprestid (jewel beetle) he personally had not previously seen. Specimens collected were forwarded to the relevant researchers and institutions. Under examination it was confirmed as an undescribed species and now in 2001 this beetle has formally been described. Dr Gianfranco Curletti from Italy has worked on a revision of the genus Agrilus from Australia. In his publications he has listed this beetles as a new species - Agrilus emu. This is quite a small buprestid with a maximum length recorded of 8.8mm. The beetle is entirely bright dark bronze, almost black in colour. At this stage larval biology is unknown. Key Words: Ootheca - a hard structure, which forms a protective covering for eggs. Way before man appeared, Cockroaches ran upon the earth. In fact fossil records show that cockroaches were around long before any dinosaur. Since these early times they have been an essential part of the ecosystems worldwide. Cockroaches are basically our habitat cleaners as they scavenge for food and in the same process assist in the recycling of material that often no other insect would touch. Simply, cockroaches help maintain a healthy balanced ecosystem. But what about cockroaches that don't live in the bush and instead have come to live inside the house! In the warmer zones of Australia cockroaches are unfortunately found inside the house. There is however a great difference between those living indoors as to those living in the garden or bush. While cockroaches living in the bush are native species, all cockroaches that live in the house are introduced species. It is these introduced species that have readily accepted our living conditions. While we can all to quickly point the finger at the cockroach as an unwelcomed guest, we must give credit to ourselves for supplying the perfect cockroach environment. This may sound strange but as we go about our daily activities around home such as cooking dinner, having a shower and even while we sit and watch television we are constantly supplying a food source for any cockroach living in the house. Without a doubt the most favoured room in the house for the German cockroach is the kitchen. For in the kitchen food is at a premium. As dinner is being prepared on the kitchen bench, cockroaches remain hidden in dark places such as inside cupboards, under the stove, even in the gaps between the cooking books on the shelf, many areas in the kitchen provide them with a safe refuge. Here they wait patiently till nightfall before they will come out of hiding. Once dark, these brazen creatures quickly scurry across the floor and like competent acrobats, climb up the kitchen bench. Once on top of the bench they scout around for any trace of food. Although the bench has been wiped clean the smallest bit of cooking residue remains, enough for a cockroach's dinner. While under the stove a grain of rice lies, another cockroach's dinner. And those roaches in the cookbooks are not studying recipes yet again another food supply has been laid out for them. As with most cookbooks they have been used during the preparation of food and a small scent of food remains from the cooks' touch. Not content with eating just the hint of food that exists, the cockroaches eat through the tasty pages. In other rooms of the house the American cockroach searches for anything that makes a suitable meal. The presence of glue on a bookbinder invites a roach's chewing. In the bathroom a tube of toothpaste carelessly left open receives many visitors through the night. While in the lounge room, roaches searching over the lounge furniture feed on any discarded hair and skin particles. Through out the whole house and where ever human activity exists, a food supply for the cockroach exists. Household cockroaches feed upon our mess. It is indeed hard to have any compassion for such a household invader but ultimately the cockroach is only out to achieve its primary function of scavenging. After all, in the house it is our waste that attracts them. In an attempt to control household cockroaches, the service of a Pest Control agent is often requested. While poison sprays can be effective it only takes a single ootheca to start the whole cycle again. Females of the American cockroach deposit their oothecae in many places such as in books, in curtains, in clothes, in fact anywhere around the house. Once emerged from their eggs, the young cockroaches take around a year to reach adult size of 44 mm in length. The American cockroach will not only live in the house but also visit the immediate areas surrounding the house such as woodpiles, sewers and garbage bins. It is the more wide spread of the pest species, the German cockroach that breeds very fast. Females carry their ootheca with them, which can be seen protruding from their rear. After a brief developmental period of 28 days the young emerge. These young will develop to adults in an astounding six weeks, ready to mate and start the cycle all over again. The German cockroach is usually found in the kitchen and rarely leaves the safety of the house. The subject of diseases associated with introduced species of cockroaches has been researched for many years. In some cases, the medical condition asthma has been linked with the cockroach. Try as we might to keep our homes clean and pest free but the household cockroach needs very little to survive. As we continue to provide the perfect environment for these pests they will always flourish. After all just like their bush relatives the act of scavenging helps to keep their environment clean. As for us, they have simply become an appendage of our existence. Reprinted with the permission of Land for Wildlife Queensland. There are around 450 species of cockroaches native to Australia. Most live in the bush under logs, in leaf litter and under the bark on trees. Generally called 'Bush Cockroaches' they are scavengers with a diet consisting mainly of decaying plant material. While some of the smallest measure as little as 3mm, north Australia is home to the largest cockroach in the world. The Giant Burrowing Cockroach (Macropanesthia rhinoceros) is a robust armour-plated insect growing up to 80mm in length and weighing in at an amazing 30gms. Living in sandy soil they make permanent underground burrows with specially excavated living chambers. Of assistance in this construction work is their heavily spiked covered legs, which flick the soil out behind them as they dig. These underground dwellers can dig more than a metre in depth. Unlike other cockroaches, which produce eggs in capsules, Giant Burrowing cockroaches are born live. From around four years of age females can produce over 20 young in a single clutch, once a year. At this stage females are quite protective over their young, which will remain with them for some months. Mother and young will share the same food supply. Feeding on a diet of dried leaf litter, Giant Burrowing cockroaches venture out at night to harvest their food supply. Having no wings they move across the forest floor, gathering material and dragging it underground to their nests where they eat at their leisure. Having a life span of around seven years or more, it is not uncommon to have a whole family living together in a single burrow. These slow-moving insect giants are unique to Australia. Nowhere else in the world do cockroaches excavate permanent burrows. They emit no foul odours nor do they bite, sting or fly. Like other bush cockroaches, Giant Burrowing cockroaches are essential to the environment. They fulfil an important ecological role, recycling nutrients in the forest. Bush cockroaches should not be confused with the household inhabitants. All 10 or so species that live in the house are actually introduced. It is this small handful of pest species that give all the other cockroaches a bad reputation. Various people in Australia are currently conducting research on the Giant Burrowing cockroaches. However, there is much to be discovered about the biology of the giants of the insect world. Australian Insect Farm. All Right Reserved.